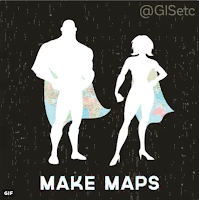 @GISEtc offers a GIF of a superhero man with broad shoulders and a superhero woman in high heels for GIS Day. The caption: Fight Evil, Make Maps. The California Geographic Alliance shared a letter from California Governor Jerry Brown declaring his strong support for geography education. The text and PDF of the letter are available on LinkedIn. @theAAG will host "a #GAWChat on Nov. 17, 2016 from 3-4 pm EST as part of #GeographyAwarenessWeek"
@RHSB Geography invites GIS Day celebration via "the free online #mapoff2016 http://themapoff.wixsite.com/mapoff"
@VerySpatial cautions: "Don’t forget to check out the stories of what Geographers do in a day or share your day at http://dayofgeography.com #dayofgeography #GAW"
Annual GIS event makes geography ordinary. The headline seems to be from John J. Nelson, GIS instructor for Del Mar and A&M-K, who "explained GIS technology has made geography ordinary." I attended the very first GIS Day event held by Northeastern University in Boston yesterday. Patrick Florence from Tufts (a few towns over) provided the keynote and four students showed of their work. One thing Patrick showed that got me thinking was how his team mapped and visualized the school's course catalog. Representatives from Boundless and DigitalGlobe were also on hand to talk about their tools and resources. "For the Geo Awareness Week in 2016 (November 13-19), GIS Cloud will introduce another GIS Day Contest and a few educational events by our team and GIS Cloud partners around the world.... Our main goal is to promote initiative in creating meaningful mapping projects that make a contribution to communities around the world, while showing how innovative geo technologies might benefit to people with different backgrounds. GIS Cloud team will select the best project ideas and help winners in the project’s realization." The CEO of Alhasan Systems e-mailed to let me know the company was celebrating GIS Day by announcing its Annual Mapping Competition. The company is based in Pakistan with partners in other areas of the world. "The objective of this activity is to promote spatial thinking among citizens for finding innovative solutions for the betterment of our communities." There are cash prizes, anyone can participate, and maps are due by the end of the year. I could find no Web presence for the contest; the company webpage seems to date to 2013. For details e-mail maps@alhasan.com. USGIF's Trajectory Magazine features some of the recipients of the organization's scholarships. North Carolina State University updated GIS videos in two YouTube playlists: Talks, webinars, workshops, Learning GRASS GIS. h/t Vaclav Petras. Tim Wallace of the New York Times offers important maps of last week's election: The Two Americas of 2016. Hexagon Geospatial announced a partnership with the DigitalGlobe Foundation to provide short-term project licenses for the duration of an approved project at an educational institution. 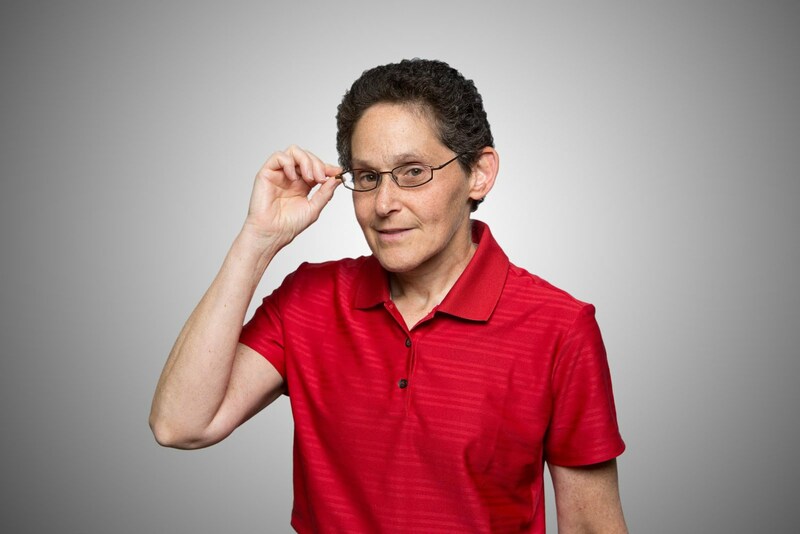 Hexagon will offer "the full geospatial chain of capabilities, from authoring the data on desktop platforms, to Enterprise, Cloud-based, and even mobile solution" including ERDAS IMAGINE, IMAGINE Photogrammetry, GeoMedia, and, Hexagon Smart M.Apps. The crew at Reddit/GIS answer the question: What to do BEFORE graduating [with a GIS degree]? In Jamaica, there are now 57 schools using GIS accessed under a Memorandum of Understanding signed between the National Spatial Data Management Division and the Ministry of Education, Youth and Information in May. There's a partnership with colleges including UWI, University of Technology (UTech), The Mico University College, and Church and Shortwood teachers’ colleges to get teachers, lecturers and students up to speed. More schools will receive software soon. For the second year in a row, Western Illinois University senior Alexis Araoz has been awarded the Outstanding Student Award during the Illinois Geographic Information Systems Association's (ILGISA) annual conference. In Belize, secondary and tertiary educators learned about GIS in a two-day workshop including exploring how to use GIS to teach math, social studies and other subjects. "Beginning with the 2016–2017 academic year, James Madison University's department of integrated science and technology will combine elements of two programs to offer a USGIF GEOINT Certificate. "As part of its educational mission, USGIF sponsors a Geospatial Intelligence Certificate Program (http://usgif.org/education/accreditation). Universities meeting the guidelines and standards of the program are authorized to nominate candidates for the certificate from the USGIF. " More from Trajectory Magazine. From a blog post by Succith Anand of Geo for All: "Our students worldwide are doing a great contribution by a genius work that they are doing now silently as the biggest donors of GIS software. ... I was joking to some students in India that if they were a proprietary GIS vendor they would be doing big press releases that they are now donating 100 billion USD!" Maria Antonia Brovelli offers details on the latest work on its work with the UN Open GIS Initiative. GoodLands partners with ESRI [sic] to launch the Catholic Geographic System - Noted because the person behind the effort, Molly Burhans, just finished a landscape design degree last year! The University of Waterloo, in Canada, was featured in GIS Day coverage by CanTech Letter. 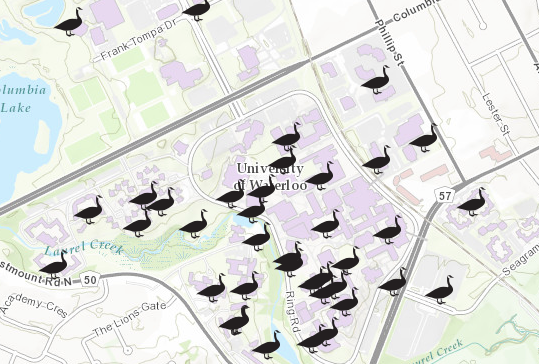 The university's GooseWatch app crowdsources locations of nesting and active Canada geese. The threat is real, as I can attest from here in New England!